The BCS is probably the most idiotic, asinine, Rube Goldbergian system in all of sports. Instead of having a simple playoffs structure wherein the best teams would play each other to determine the #1 team in the nation, an incredibly complicated and obtuse formula (with so many moving parts and factors that it can ONLY be determined by super-computers) decides what teams play for the championship. This means that sometimes deserving teams like Boise State get jobbed when they needn’t be. So, if you’re looking to have someone defend something idiotic, asinine and hated by everyone else, where do you turn? The Bush White House of course! 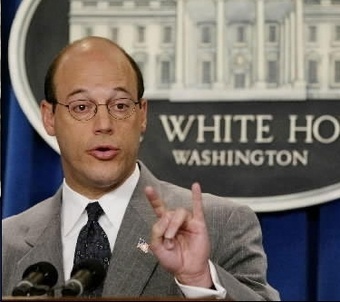 The BCS has hired former White House flak Ari Fleischer, who was the press secretary from 2001-2003. Who better to support indefensible procedures that run contrary to everything that makes intellectual sense and instead lose sight of the original purpose in the first place! Looks like that playoff system should be in place right around the same time our deficit created by Halliburton starts to get down to the mere $1-5 trillion range. OK, but who determines which teams make those playoffs? If you totally eliminate the BCS, you’re back with the AP Poll. Do you really feel comfortable trusting sportswriters? I mean, those guys gave Jeter 4 Gold Gloves. Don’t fear computers, Slanch. That’s where Travian lives. and your point about sportswriters is almost fair, except sportswriters dont give out the gold gloves, the coaches and managers award those. that said, i dont trust sportswriters, but they can get the top 8 roughly right, i mean, sure, there will always be SOMEONE on the outs who think they should be in, but so long as the top teams are able to legitimately vie for the championship I’ll be happy. I mean, i still wont watch because college football is stupid, but i’ll appreciate it. And they can keep the computers to help determine the top 8, it just should then go to a playoffs as opposed to deciding these two teams get to play and no one else.